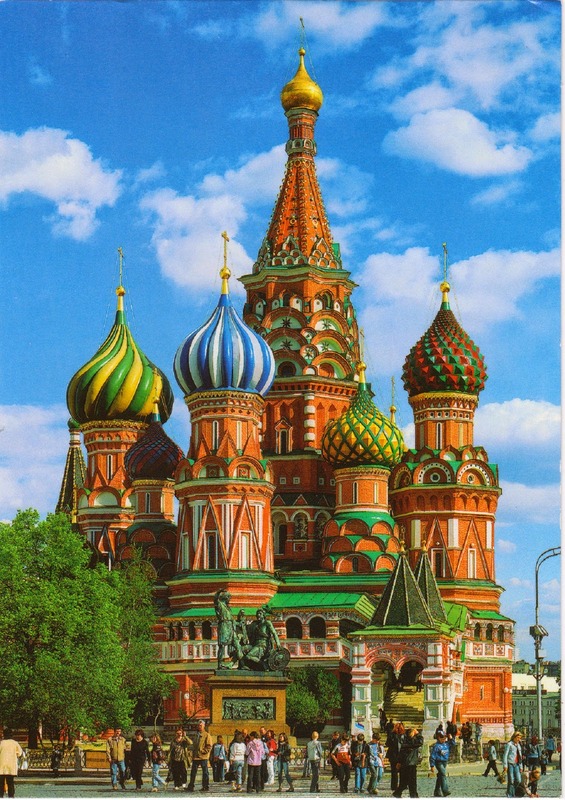 RU-3443849 came from Russia with two postcards showing various landmarks in Moscow, one of which features Saint Basil's Cathedral, once a Orthodox church and now a part of the State Historical Museum in Red Square in Moscow, Russia. The building, located in immediate proximity of the Kremlin Palace, is officially known as the Cathedral of the Intercession of the Most Holy Theotokos on the Moat. Built from 1555 to 1561 on orders from Ivan the Terrible to commemorate the siege of Kazan, it was once the tallest building in Moscow until the completion of the Ivan the Great Bell Tower in 1600. Shaped as a flame of a bonfire, the Cathedral has a unique design with eight side churches surrounding around the ninth church of Intercession in the center. It was recognized as part of the Kremlin and Red Square UNESCO World Heritage Site in 1990.